Watch for pets sickened by eating rich holiday leftovers or cooked turkey and ham bones. Don’t feed turkey skin or fat trimmings. Chocolate, candies, and sweets (especially those with xylitol) are dangerous. Remind visitors to enter and exit quickly so pets don’t escape! … A Complete Guide to Protecting Your Pooch, Indoors and Out” by Melanie Monteiro. This is one for your bookshelf, a thorough and detailed reference to help keep your dog safe from the many hazards around the home and neighborhood. 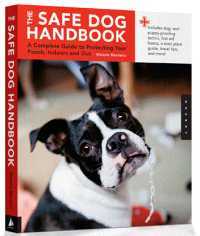 But wait… the author recommends you keep the book with your dog’s first aid kit instead of a bookshelf. Good idea! Buy your copy here: www.thesafedoghandbook.com . In addition to providing essential health care knowledge, the author guides families to make dog-safe home, yard and garden environments. Finally, this well-organized book is coil bound to lay flat, so you can refer to the book while performing urgent actions if needed. This could be the best $20 you ever spent.